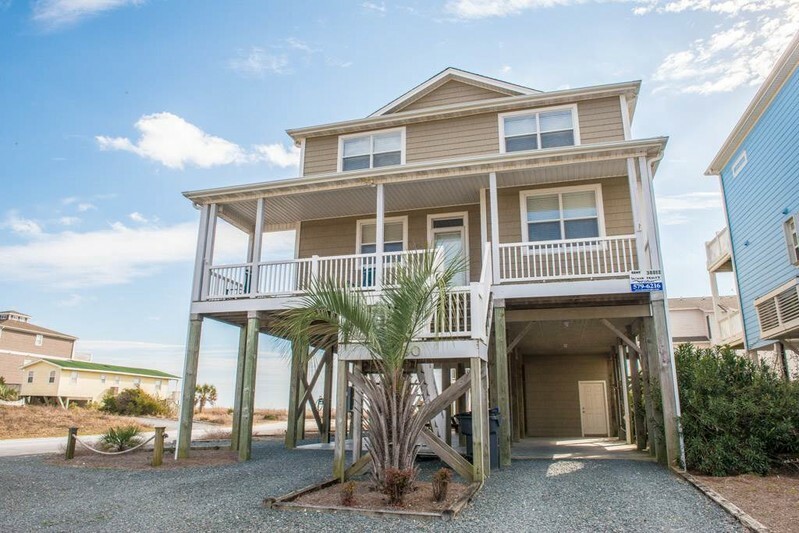 Second row, 5 bedroom, 4 bath, well-maintained and comfortable beach home. Quick walk to the ocean or take it easy and enjoy the ocean views from the covered porch. Open, bright and spacious with fully equipped kitchen with a microwave and dishwasher plus lots of available seating in dining area. There is a high chair and pack-n-play for the younger set. Amenities include open living area with large plasma TV, Internet service, 6 televisions, 2 DVD players, CD player, and Surround Sound. Outside there is a hot/cold enclosed shower, charcoal grill, covered decks and sundeck with new porch furniture. Sleeps 15 Bedding: 1st Floor: King, Queen. 2nd Floor: Queen/Single, 2 Queens, Queen, 2 Singles in bonus room. Weekly rentals only! Non-smoking, no pets.